I trained in integrative counselling and on our course we were encouraged to form a coherent philosophy of counselling and to choose a framework to gel our work, which as integrative counsellors can involve several differing approaches. We were presented with various humanistic frameworks e.g. Clarkson's 5 Modalities of Relationship, The 7 Level Model (also Clarkson - the framework for our training, along with the BACP Ethical Framework), Heron's 6 Categories of Intervention. I struggled to find something that could adequately hold my practice in a way satisfactory to me and I ended up cobbling together 2 models to form a personalised framework. I opted for Clarkson's 5 Modalities of Relationship and Erskine's 8 Relational Needs. This was the best fit for my personal philosophy which is about meeting the client where they need to be met and working from that base point. 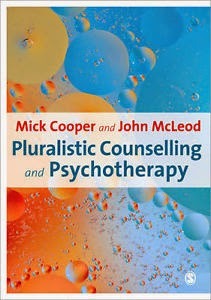 I was profoundly influenced by Mick Cooper and Dave Mearns' work in the book Working at Relational Depth in Counselling and Psychotherapy during my final year of training and very much enjoyed attending a workshop on Relational Depth held by Mick Cooper in Exeter last year. I wrote about that experience here. The Person-Centred Association South West invited Mick Cooper down to Exeter again this year and l was very excited about attending this workshop; Pluralistic Therapy - Extending Person-Centred Principles to Integrative Practice. Pluralistic therapy is a philosophy of therapy rather than a technique, a concept that sits better with me as I find adherence to one particular school of thought somewhat reductionist, and I believe that it can get in the way of discovering what each individual actually wants or needs. I think that this is why I preferred working with children with special needs as there was more flexibility to stray away from the curriculum and work with exactly what each child needed to flourish. "A person-centred, humanistic, integrative approach"
Through extensive research Mick Cooper and John McCleod are shattering the myths that many therapists hold. Apparently, clients generally prefer us to be more challenging than we believe they want us to be. But at the same time, clients find it hard to say what they want because of the power imbalance. As I have said before in this blog, I don't want there to be a power imbalance in my therapeutic relationships but the fact is that power is bestowed on us by some clients who may think that we are expert, or more "sorted" somehow. CLIENTS DO BETTER IN THEIR PREFERRED THERAPIES and are 50% less likely to drop out. Clients feel more empowered when there is shared decision making, however, some want to have a say and some don't want to at all. What's important here is that clients differ in their wants and adhering to the dogma of one singular approach is not necessarily in a client's best interest (although it might be!). The term pluralism derives from a philosophical outlook which was explored in William James' A Pluralistic Universe (1908) and by Isaiah Berlin and is the opposite of the philosophical stance of monism, which holds that there is only one ultimate truth. Pluralism holds the belief that there is no one ultimate truth and that there are multiple right answers to a question. There is an openness to ambiguity and multiple perspectives. Or as Mick said "Allowing the messiness is a more democratic way of being with another". This corresponds very well with my personal philosophical viewpoint and so, as I was hoping, the workshop was proving to be music to my ears. Another word offered by Mick to explain the approach was dialogic. Mick looked at the common arguments in the therapy world, i.e. "relationship versus technique" and 'single orientation versus integrative/eclectic approaches", 'pro/anti-pharmaceuticals" and argued that with pluralistic thinking we don't have to polarise. It was clarified that these two definitions come from different traditions. Pluralistic practice is described as "collaborative, integrative practice". Integrative practice does not necessarily involve client collaboration. Pluralism would involve client-focused integration rather than therapist-focused integration. This is the word used to describe the talking about the process of counselling itself rather than the issues brought to the room and is central to the pluralistic approach. Is the therapy working well for the client? What is their preferred style of counselling and which techniques/approaches do they feel comfortable with? What do they want to get out of therapy and are they on track? a client may want to be seen to be a "good client"
a client may view the therapist as "expert"
So the onus is on us as therapists to check out with the client regularly. Mick also informed us, and I was certainly quite surprised by this, that although form-filling may feel quite mechanistic to therapists, clients are generally happy to do so. Apparently clients often find it difficult to voice their experiences and giving feedback forms offers a "third space" for clients to address metatherapeutic dialogue. I have to fill in lots of forms, as do my clients, for the GamCare work I do. I shall look on it with a new perspective. Mick wanted to demonstrate how one of his forms can be part of the initial session with a client. He gave us a form that he himself uses and refers to as a Goal Assessment Form where goals of therapy are agreed and written down, then the form is completed regularly with the client indicating how far up the scale they think they are to achieving the goal. Nobody was volunteering to be the client and I was in the mood for putting myself out of my comfort zone, so I played the client. I used actual therapeutic issues which was scary seeing I was in a room with 40 or so professional peers. Anyway, it was a good mini session and I came away seeing the value of really pinning down the therapeutic goals (and thinking that Mick would be good for the job…shame he's miles away). In my own practice I have for a while made it part of the initial session to agree the goals for therapy and review from time to time to see if we are on track. I'm not sure I would use the form as supplied by Mick but I might try and formalise and refine the review process. As a result of the thinking that this workshop encouraged I will be making some subtle changes to my practice. The finer detail is currently being considered but I'm looking at extending the content of my contract, and sending an information sheet to newly booked clients. I'm not entirely sure how that compares with other therapists, but I feel happy to describe myself accordingly. Somebody at the workshop asked Mick why he had changed his mind about the importance of relational depth (which I understand to be a shift towards stressing that although it is what many clients need, it isn't necessarily what all clients need). Mick replied that he was quite proud of his ability to change his current thinking as he learns more through research and experience. What a breath fresh air. Fingers crossed Mick might pop over to Exeter again next year to deliver another thought provoking workshop that therapists can really use to enhance their practice - the whole purpose of Continued Professional Development (no pressure). Very interesting reflection on what sounds like a very though provoking workshop. From my experience and point of view, I identified strongly with the idea of a counsellor 'challenging' a client more than just sitting back with what the client brings to the session. It's something I need as otherwise there is no way to get at the heart of what's going on, it's just too hard to open up without some pushing. Only ever, in over 10years struggling to talk about things, have found one counsellor who sees through the facade and was brave or perceptive enough to push through it too. Thank you for your comment. It's really useful to hear from service users. I'm interested in what counsellors have to say but I think the best people to listen to are those who actually engage in therapy. Not all therapists do or have.